Oops. 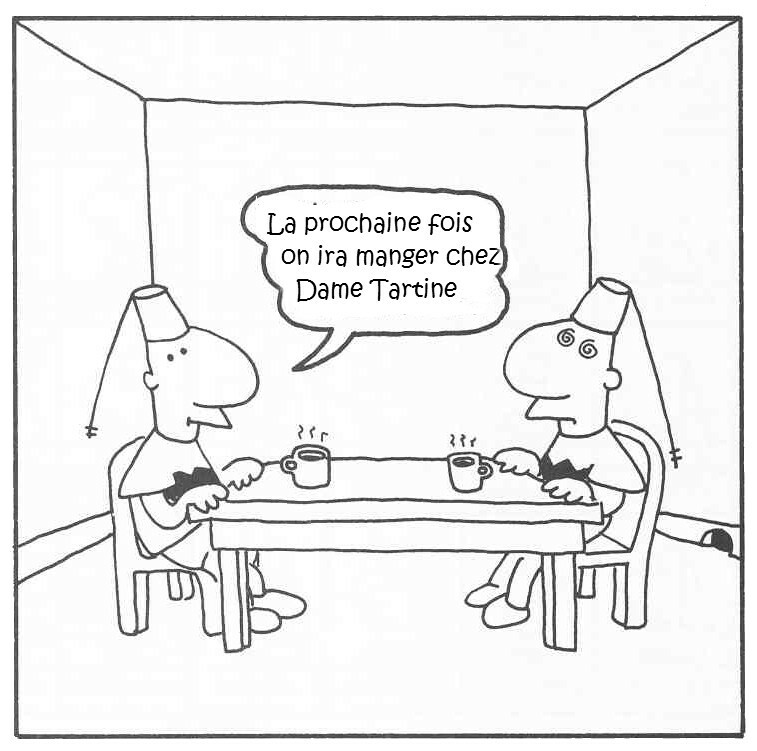 That’s not Ajvar and Pinjur, it’s Akbar and Jeff from Life in Hell, with apologies to creator Matt Groening. If you happened to see my earlier post on lutenitza, you’ll recall that I promised to return with a further exam of its kissing cousins, ajvar and pinjur. First, let’s have a look at the real deal. The REAL Ajvar and Pinjur. 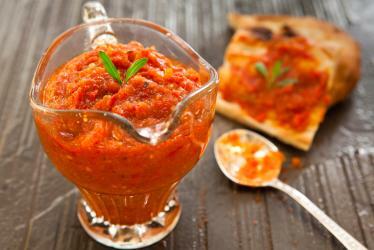 Although thought to be Serbian in origin, ajvar (pronounced “EYE-var”) is said to have derived its name from the Turkish word havyar, which shares an etymology with “caviar.” [In Russian as well, the word ikra (or икра), can mean both traditional caviar and also a vegetable purée or paté.] It’s made from red peppers, aubergines, garlic, oil, and spices. 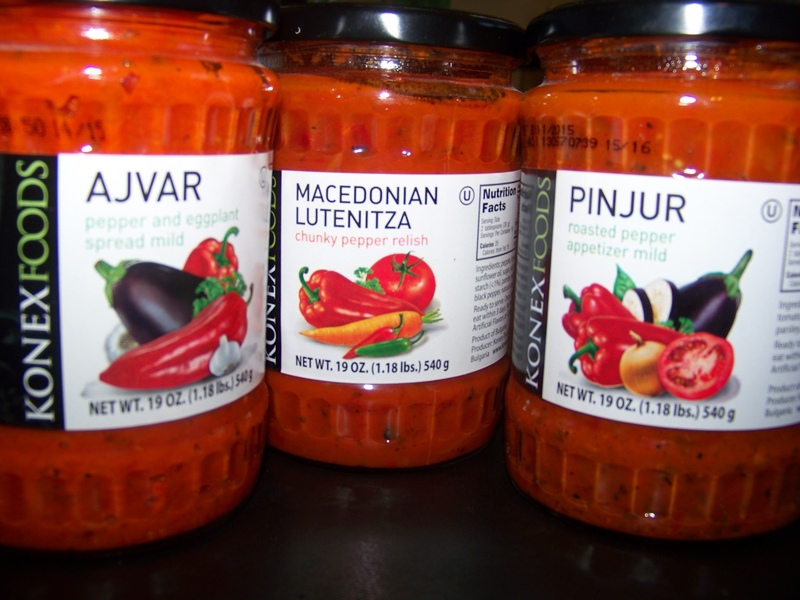 Both lutenitza and pinjur, which share many ingredients with ajvar, generally include tomatoes, while ajvar does not. Perhaps the most striking difference between ajvar and the other two, though, is its consistency; you can turn a room temperature jar of ajvar upside down without spilling its contents. Pinjur and lutenitza, not so much. Depending on the recipe, ajvar may be made with smoked or roasted peppers or not; in this bottled version, the peppers are not roasted, giving it a lighter, brighter flavour than either the pinjur or the lutenitza. The FatFree Vegan Kitchen blog has an excellent (and quite healthy) recipe for homemade ajvar, as does the Kitchen Window blog at NPR (where they dub the dish “Serbian Salsa“). In both cases, these recipes opt for roasting the red peppers. Pinjur (also known as pindur, pindjur, pindzur, and pinđur) is widely available throughout Serbia, Bosnia, Herzegovina, Bulgaria, and Macedonia. Just in case you’re unclear on just where all these places are, here’s a map. 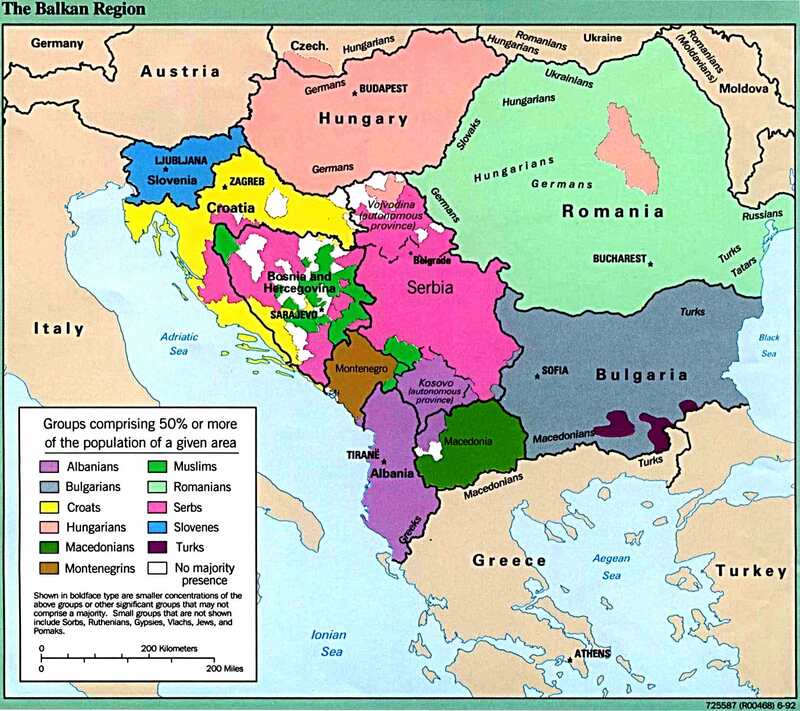 For the geographically challenged, this is where ajvar and pinjur come from. Photo courtesy Univ. of Texas Library. 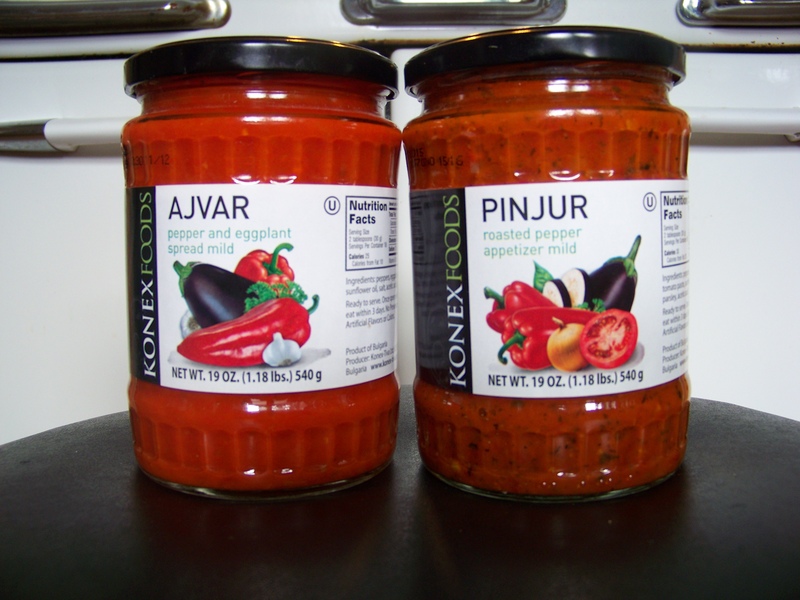 Unlike ajvar, which is more of a spread, pinjur (pronounced “PEEN-jur”) resembles a salsa or sauce. And, like salsas and sauces, it comes in a fairly wide variety of styles. It’s generally characterized as being an aubergine (eggplant)-based sauce/relish, rather than a roasted pepper sauce/relish, even though lutenitza generally contains aubergines, and pinjur generally contains roasted peppers. Confusing, ain’t it? In my limited experience so far, lutenitza is a little spicier than pinjur, but there are so many variants on the recipes, it would be impossible to make a generalization that really sticks. 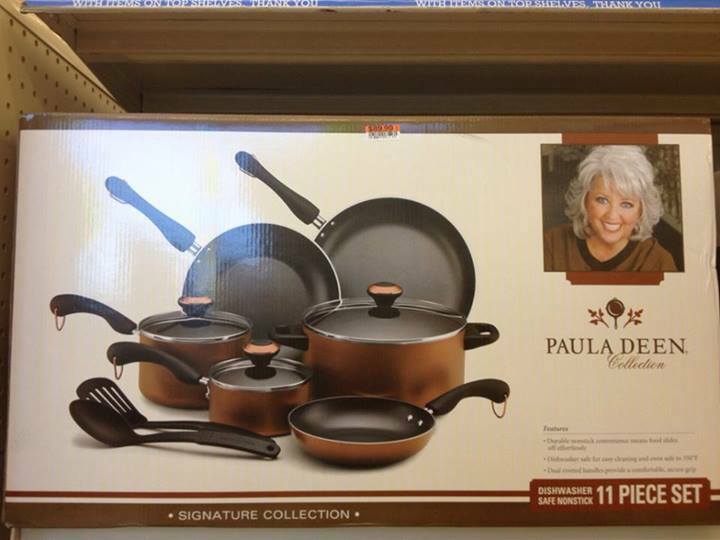 Dealer’s choice here. Both pinjur and lutenitza are terrific mixed in with rice, ladled over vegetables or meat, or as a dip for chips; they can be served either warm or at room temperature. Both are gluten-free and vegan (as is ajvar), and they’re all a great way of dealing with the overabundance of vegetables from the summer garden, offering a tasty treat for home canning enthusiasts well into the winter months… provided you can wait that long to break into those jars. The Food Network’s UK website has a tomato and pepper-free recipe for pinjur that relies heavily on aubergine for its base, but if you want something closer to the commercially available versions, you can opt for this recipe from the Healthy Food Base blog.